It is no huge surprise that Sarah Wollaston has called time as a Conservative MP and will sit in the House of Commons as an Independent one. For some time now she has been increasingly critical of the Government and the way it’s running the party. She was a supporter of Theresa May’s leadership when the former Home Secretary launched her campaign in 2016 to become party leader, but votes from Wollaston are not something the PM has been able to rely on. The Totnes MP tweeted that it was with ‘regret’ she was resigning from the Conservative Party. 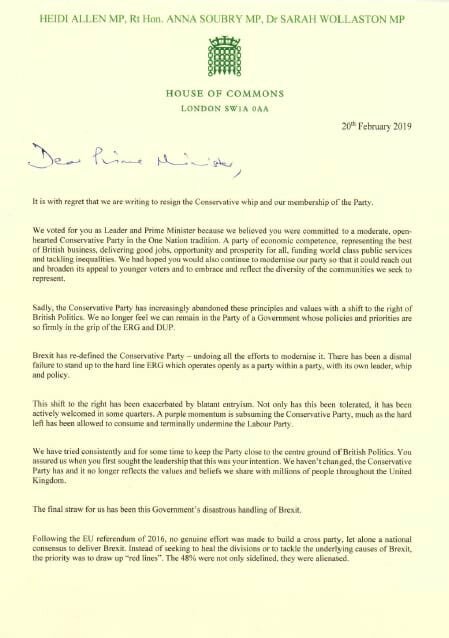 A letter written by her and two other Conservative MPs say they initially backed Mrs May as party leader because she talked about being committed to a ‘moderate, open-hearted Conservative Party’, but the letter goes on to say that ‘sadly the party has increasingly abandoned these principles’ and has shifted to the right. Sarah Wollaston has long been critical of the Government's response to the roll out of Universal Credit and also reacting to the changing demands on health and social care. But it seems that it is Brexit that’s pushed the group of three over the edge. Saying they can ‘no longer act as bystanders’ and that the country ‘deserves better’. When the EU Referendum was launched Wollaston initially backed Leave, but became disillusioned with the promises made on the campaign and moved to back Remain. Since then she’s spoken out against the threat of a ‘no deal’ Brexit and became an early supporter of a second referendum. Her constituency of Totnes voted to leave the EU and recently there have attempts to start the process in the local association of deselecting her as a party candidate, she’s beaten them to that and has jumped before she could be pushed. The physical act of crossing the House of Commons today and sitting opposite her former party won’t have been something she will have relished, but something she will have come to the reality is the only thing she can do to achieve what she has promised constituents she would achieve. Perhaps understandably she comes in for a lot of criticism from Leave campaigners, some in her local party, and the wider Conservative Party, will be glad she has quit today. Sarah Wollaston is unique though in the way she became an MP. With Totnes a relatively safe Tory seat, under David Cameron’s idea, her selection was put out to an ‘open primary’, where voters and not just local Conservatives selected the party candidate. This means she is likely to have a stronger support base than just traditional Conservative voters. As a result of today’s defection of three former Conservative MPs and eight Labour MPs earlier in the week, there is now an 11-strong centrist independent group in Parliament. It makes an already unstable Parliamentary arithmetic even more unpredictable. I don’t think Sarah Wollaston will have taken this decision lightly and she knows she will face a barrage of abuse, but it’s clear, for her, enough is enough.